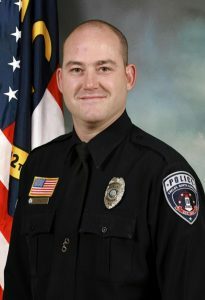 Shelby, N.C. – The North Carolina Department of Transportation (NCDOT) officially named the N.C. Highway 18 bridge at S. Lafayette Street in Shelby, N.C. after fallen city police Officer Tim Brackeen on Wednesday, honoring his sacrifice on the second anniversary of his line-of-duty shooting death in 2016. The North Carolina General Assembly directed NCDOT to name the bridge over N.C. Highway 74 after Officer Brackeen in the state budget during the short legislative session this summer. State law and department policies required legislative action to name a state-maintained bridge after a local law enforcement officer. 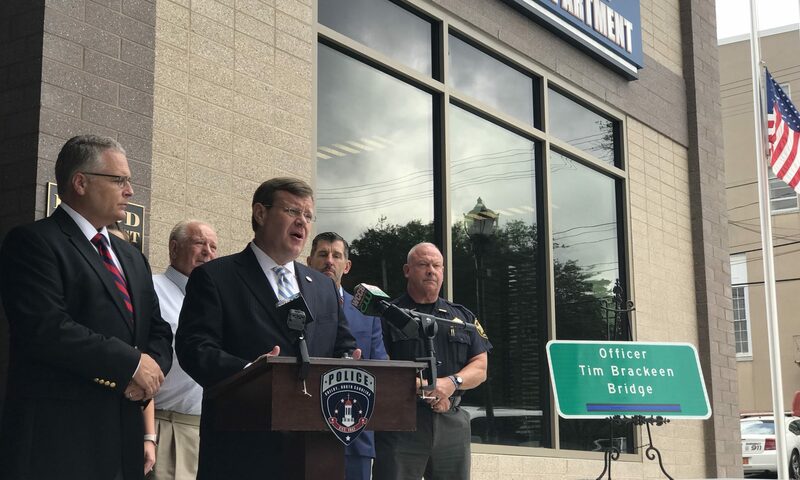 The department erected signs officially designating the overpass ‘Officer Tim Brackeen Bridge’ in Shelby on Wednesday morning. State House Speaker Tim Moore (R-Cleveland), who represents Shelby in the North Carolina House of Representatives, joined Officer Brackeen’s colleagues and family members at the Shelby Police Department to unveil the sign design and honor his memory. Speaker Moore said he would file draft legislation at the dedication to strengthen penalties for assaulting or attempting to assault law enforcement officers with a firearm. Moore provided a bill draft that would heighten the penalty for pointing a firearm at a law enforcement officer from a Class E to a Class D felony, heighten the penalty for discharging a firearm during the assault of a police officer to a Class C felony, and raise the penalty for infliction of serious injury on a police officer with a firearm to a Class B2 felony. Shelby City Police K-9 Officer Timothy James Brackeen, was shot on September 10, 2016, while he attempted to serve a warrant. He died two days later at Carolinas Medical Center in Charlotte, N.C., at just 38 years old, leaving behind a wife and young daughter. Police say Brackeen was trying to serve a warrant to 23-year-old Irving Fenner at 12:21 a.m. on Saturday, September 10. He reportedly found Fenner at 212 Gidney St., Shelby, near Bethel Baptist Church, police said. The two struggled outside the home, and Brackeen was shot in the chest, Ledford said. Other officers arriving on the scene heard the sound of gunfire, and when they went to Brackeen’s location, they found him outside the home and injured. Brackeen was wearing his bulletproof vest at the time of the shooting. Brackeen was with the Shelby Police Department since July 2004 and was assigned as a K-9 officer for the department with his partner, Ciko (psycho).